This is a well-known trick but I’m posting it here since I often have a hard time tracking it down when I need it for an introductory coding theory talk or something. Hopefully someone else will find it amusing too! Let and let be the set of all vectors in the third column below (for simplicity, we omit commas and parentheses, so is written instead of , for example). This is a linear code of length 7, dimension 4, and minimum distance 3. It is called the Hamming [7,4,3]-code.
. Moreover, the matrix is a generator matrix. Now, suppose a codeword is sent over a noisy channel and denote the received word by . We assume at most 1 error was made. 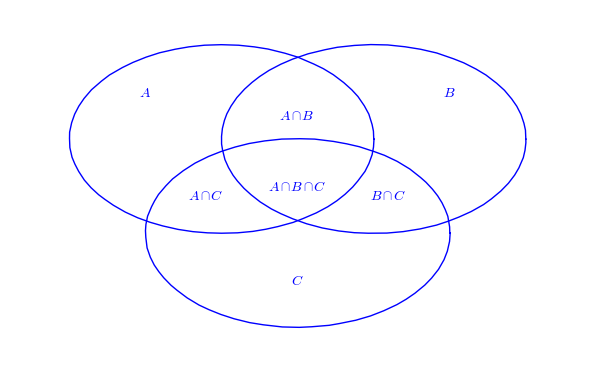 Put in the region of the Venn diagram above associated to coordinate in the table below, . Do parity checks on each of the circles , , and . Exercise: Decode in the binary Hamming code using this algorithm. Someone thinks of a number between one and one million (which is just less than 220). Another person is allowed to ask up to twenty questions, to which the first person is supposed to answer only yes or no. Obviously, the number can be guessed by asking first: Is the number in the first half-million? and then again reduce the reservoir of numbers in the next question by one-half, and so on. Finally, the number is obtained in less than log2(1000000). Now suppose one were allowed to lie once or twice, then how many questions would one need to get the right answer? Player 1 has to convert his number to binary and encode it as a Hamming [7,4,3] codeword. A table containing all 16 codewords is included above for reference. Player 2 then asks seven questions of the form, “Is the i-th bit of your 7-tuple a 1?” Player 1’s answers form the new 7-tuple, , and each coordinate is placed in the corresponding region of the circle. If Player 1 was completely truthful, then the codeword’s parity conditions hold. This means that the 7-tuple generated by Player 2’s questions will match a 7-tuple from the codeword table above. At this point, Player 2 just has to decode his 7-tuple into an integer using the codeword table above to win the game. A single lie, however, will yield a 7-tuple unlike any in the codeword table. If this is the case, Player 2 must error-check the received codeword using the three parity check bits and the decoding table above. In other words, once Player 2 determines the position of the erroneous bit, he corrects it by “flipping its bit”. Decoding the corrected codeword will yield Player 1’s original number. [H] R. Hill, “Searching with lies,” in Surveys in Combinatorics, ed. by P. Rowlinson, London Math Soc, Lecture Notes Series # 218. [N] I. Niven, “Coding theory applied to a problem of Ulam,” Math Mag 61(1988)275-281. [U] S. Ulam, Adventures of a mathematician, Scribner and Sons, New York, 1976 . In other words, Player picked 4 and lied on the 6th question. Why is this decoded word different? Because the Sage Hamming code is distinct (though “equivalent” to) the Hamming code we used in the example above. 1 . . 1 . 1 .
. . . 1 1 1 . This entry was posted in Uncategorized and tagged desauto, gap, guava, Hamming code, math, sage, Ulam's problem. Bookmark the permalink.